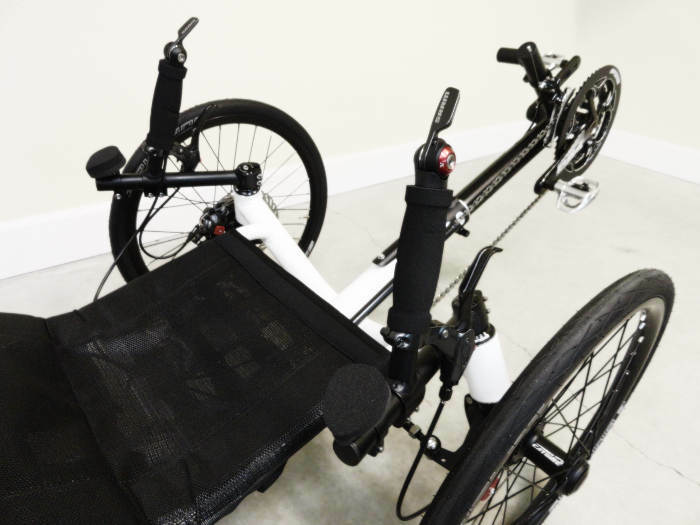 This page tells about the acquisition of the new trike. 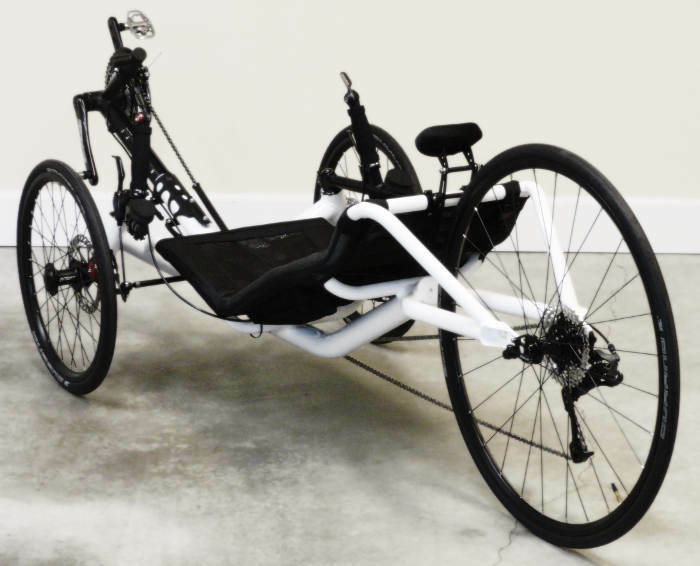 If you are seeking current thoughts about this trike, subsequent to the acquisition of it as detailed below, please click HERE instead. 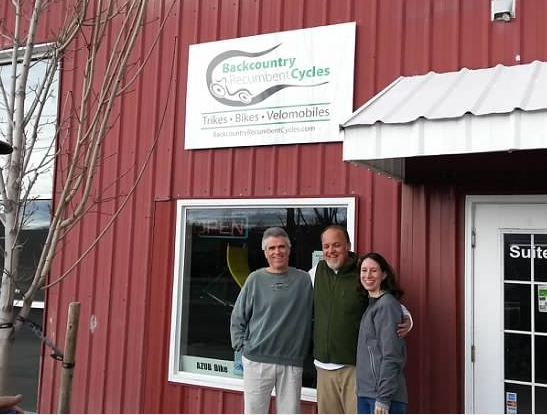 On March 08, 2014, I borrowed a car (carbon offset, of course), set off at 5:00 AM, drove over two mountain ranges, and spent much of the day at Backcountry Recumbent Cycles, central Oregon’s premier recumbent cycling center, owned by Mark Waters. The reason for this marathon day of driving was to acquire my new trike, and the closest expert who sells trikes was 189 miles distant. 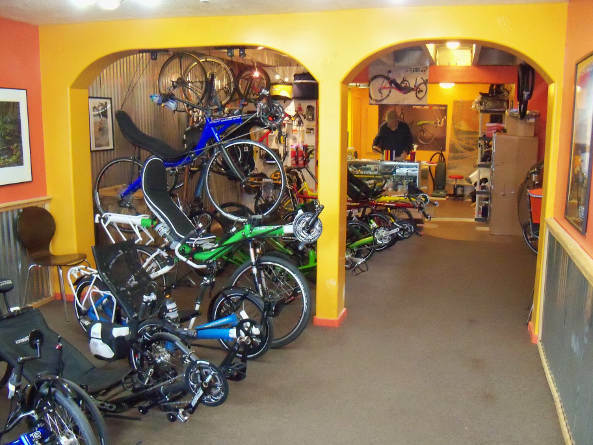 Mark knows his stuff, and the cozy little shop sells Greenspeed, ICE, Catrike, Azub, and Performer trikes, along with a few bicycles to boot. Mark and his wife Renge’ are the coolest folks you could hope to meet, especially since they happen to love tricycles almost as much as I do. So, there is much to tell, and it will all be shared here as I make time to get to the keyboard. You see, I have a brand spankin’ new wild fire-breathing thoroughbred sitting downstairs in the garage, and, as much as I am addicted to sitting here typing out words to you wonderful triangular enthusiasts around this planet, I also need to set aside some quality time with this speed trike that is continually beckoning me like a siren’s song to ride long and fast. I can’t ride right now though, as the rain is pummeling down upon the ground outside, so here I speak to you instead. 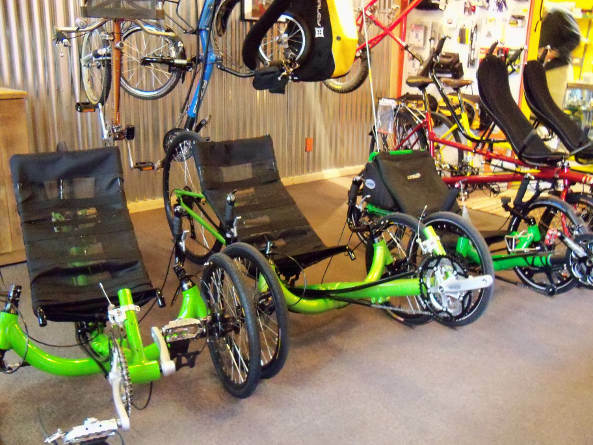 Greenspeed, ICE, Catrike, Azub, and Performer trikes are available for test rides. 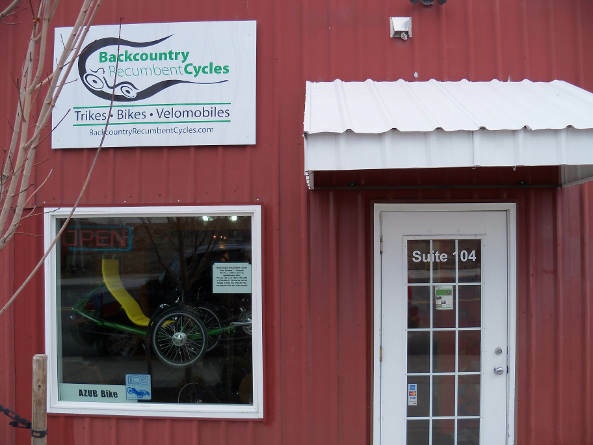 I love this store, friendly and welcoming, cozy and full of recumbents. 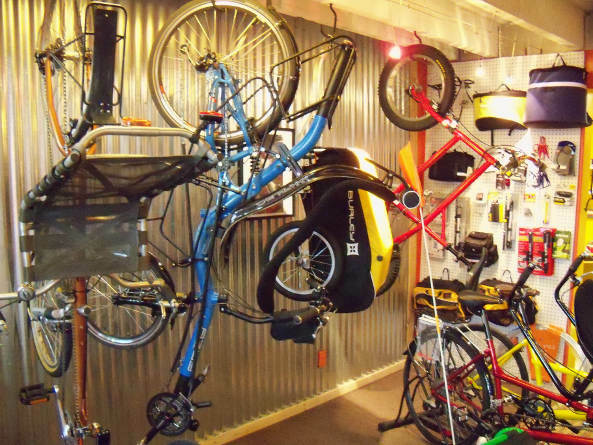 Here are two Performer trikes and one Catrike Pocket trike. The Greenspeed is hanging up in the front picture window of the store. There is so much to see here, a triker’s dream realm. 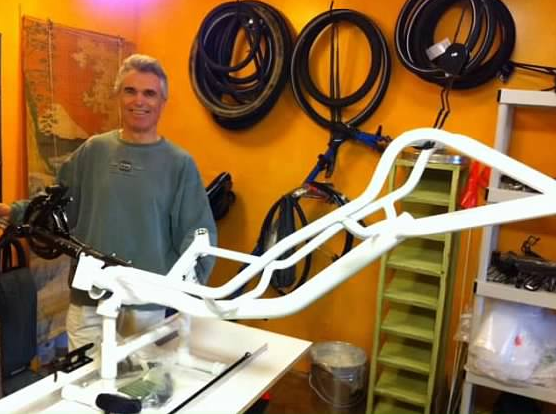 Here’s old man Mark Waters himself, just about to get to work assembling my new trike. 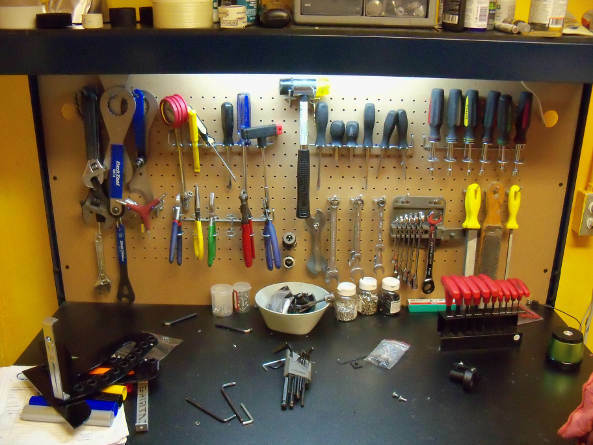 This is one of Mark’s workbenches, loaded with all kinds of cool recumbent assembly and repair tools. Okay, I’m back at the keyboard, the seemingly eternal slave to words. You know, there are only three things in life that have the ability to pull me away from this madness of mine called writing. Well, that’s not exactly true, but what I mean is three important things, not stuff like going to the bathroom. Those three things are physical interaction with my tricycle (as in riding or tinkering endlessly), working out with weights, and three … well, guess what the third item is! Hint: kids would never even think of this, but a crazy guy like me would. Okay, got it? For those who are stymied, I’ll go ahead and list it here: The third big thing in life that has the power to pull me away from the keyboard is refueling the machine (me) with an activity I’ve been doing since I was 18 years old: Making a protein drink to feed the muscles, which is important now because the new trike is going to demand a lot from me! Oh, one more thing before I forget! This is really important for sure. Hair. Yep, I like the looks of long hair, yet I enjoy the benefits of short hair (especially on trike journeys). I’ve been told that my hair gets very wavy the longer it gets, so sometimes I just let it grow out a bunch. Then, there’s always this issue with having to comb it, and if I’m out in the wind, well, it starts looking really bad really fast, then I look terrible (even worse than normal). I guess I may have been inspired talking with Mark while assembling the trike, seeing he has no issue with wind in his hair. Then, today while eating my protein surge at lunch, the idea hit me! Like a thunderbolt out of the blue, I realized I could retain those wavy locks and also be able to stand in the wind without having a bad hair day! The best of both worlds! And what better time than now, what with a new super fast trike and all, I decided to give myself a super fast triker’s haircut (I stopped doing barbers about ten years ago, and became a D.Y.I haircutter). I even named this new hair style, a real must for serious speed trikers, with a snappy name: the Wild Child Speed Cut. For the past hour now, the top of my head has inch long hair, a little longer on the sides, and the whole thing tapers into those wavy strands in the back – man, it just looks FAST! We’ll see if I like it enough to keep it. Why the Wild Child Speed Cut name, you may be asking yourself as you scratch your head full of curly locks? 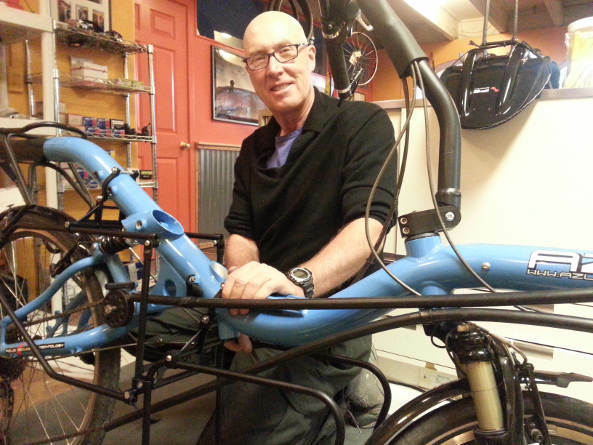 Well, the trike I had for the past five years, and then sold to Bruce Morgan at the 2013 RCC, had a name I really liked. I did not name it – the ICE factory did, and I simply referred to it as the Q (as my long time readers know). So, I got to thinking that it would be cool to have a short snappy moniker for the new triple too. Many ideas freely flowed in and out of my head, and after a few days of thinking, I was totally befuddled about it, as I liked several of them. Turns out, I wanted something that would impart the spirit of the new trike, what it feels like to ride it. Something powerful and wild. Wild Child was my choice, after much agonizing and second guessing (NEWS BREAK: Thor was actually my first choice, but after sitting with it for a week, I finally came to the conclusion that it was drenched with overtones of violence, and thus at odds with my life ideological principles. So, I invoked my “second guess” option and changed it on March 18th.). The Wild Child name is all about spirit – how it moves me. The trike has a wild spirit, and like a child, it will transport me into all manner of bizarre adventures never known to normal people called adults. I may be an adult, but when I go out to play with Wild Child, that portion of me becomes something else, something wild and crazy! 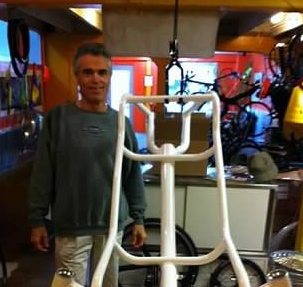 Here the trike hobo stands next to the new frame, just out of the box. I’m smiling because this is pretty darn exciting! 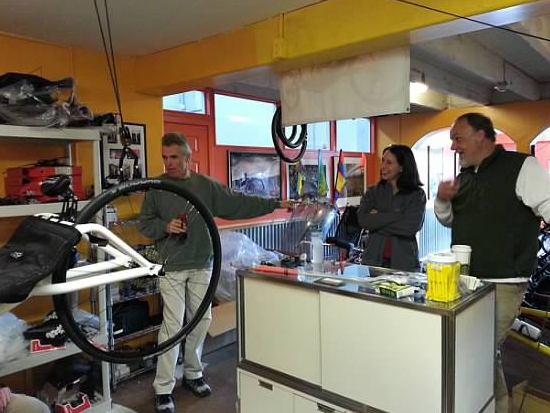 The birth of my new trike before my very eyes. I even got to attend the primary physician, even though labor charges doubled with me in the work area. 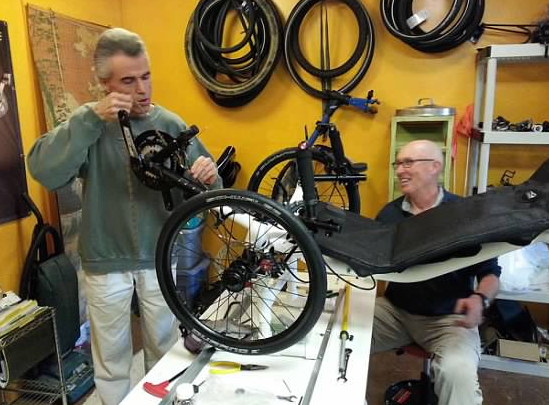 Here, Mark, the racy recumbent rider, fiddles with something while being distracted by a couple of people in front of his counter, folks I’ll talk about in a minute. That’s my hair before the Wild Child Speed Cut. That’s Jeremy Bradshaw in the background. My old buddies from 2009, trikers Stephanie and Jeremy, share a few fun thoughts about trikes. Actually, I’m not doing anything helpful here, simply trying to look important. Mark is laughing his head off at my ineptness. Whenever I messed up, he made things right. Okay, back to the work at hand. Wild Child is waiting, and Mark is getting hungry for lunch! Somehow, we managed to get the assembly done while still daylight outside. Gee, is this trike ever light! At just a hair over 33 pounds, it feels like a feather to me! Pictured left to right: trike hobo, Jeremy Bradshaw, and Stephanie Bradshaw. 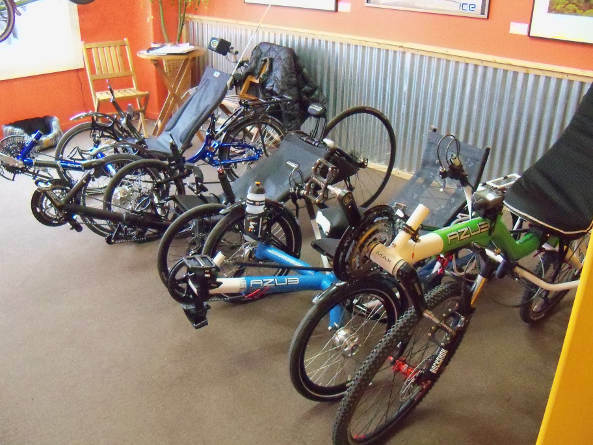 Okay, now for the story about these happy-go-lucky trikesters: Back in 2009, a few weeks after I bought my ICE Q for my journey to Death Valley National Park, I was in Newport, Oregon at the Bike Newport bicycle shop. My cycling buddy Matt Jensen, a Catrike 700 rider at the time, has a cousin who happens to own that shop, so I stopped in to meet her. Well, as I’m walking up to the bicycle shop, there are two Catrikes parked out front, with trailers, obviously belonging to someone on a long-haul trek down the Pacific Coast. They showed the signs of road riding, so I was eager to meet the riders and talk to them. The Catrike owners were Jeremy and Stephanie Bradshaw of Alaska, on their way south to California. He was riding a Catrike Expedition, and she was riding a Catrike Pocket. Jeremy is a great guy, and was very happy to answer all my questions on how to trike tour (at the time, I had yet to try it, and wanted to know what to expect). 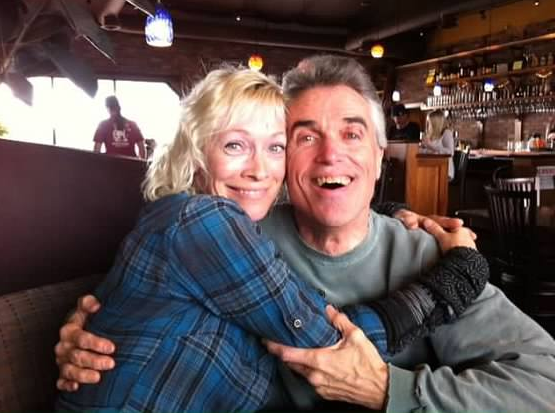 I asked him so many questions that Stephanie finally went next door to do the laundry, convinced that I had her husband captive, and they would not be getting to the campground south of the huge Newport bridge any time soon. Eventually, I realized they needed to really leave, so I shut-up and that was that. I never expected to see them again. Jeremy and Stephanie’s wedding – on bicycles! 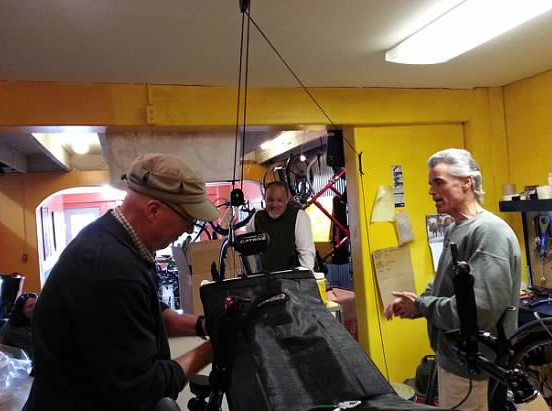 So, as the powers of the cosmos came to be, when Mark arrived at his recumbent shop Saturday, he said he had a surprise for me, and proceeded to tell me some old friends would be stopping by the shop later to possibly buy a trike. Yep, it was Jeremy and Stephanie! What are the chances? I could not believe how great it was going to be to see them again, especially now after having completed three overland trike journeys myself, and having written two books about recumbent tadpole trikes. About noon, they got to the shop, having driven 7 hours to get there. I had driven nearly 4 hours myself, and we came to find out that we all left our homes around 5:00 AM that morning, to converge, after five years, on a tiny little trike shop in Bend, Oregon. We were all amazed. Read Jeremy and Stephanie’s trike journal, Over The River and Through Some Woods, HERE, and read about the trike trek I took soon after meeting them in 2009 HERE. 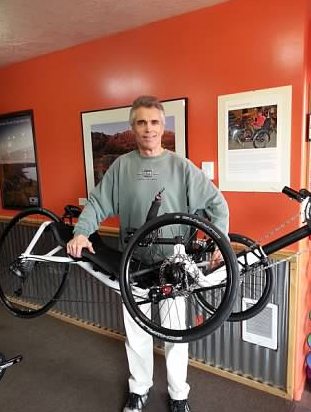 By the way, Saturday at Mark’s shop, Jeremy bought Mark’s Catrike 700 demo trike off the floor, a black beauty that is sleek and fast. 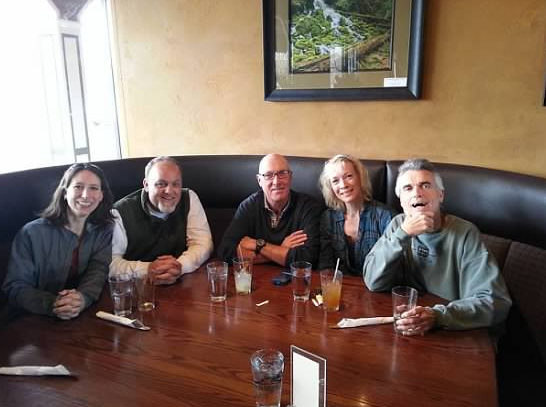 Here is the fun loving silly gang, all together at a local restaurant after all that serious trike work was finished. From left to right: Stephanie, Jeremy, Mark, Renge’, and steve. I should have been on the road back home instead of sitting here, because I wanted to make the long drive over the two mountain ranges before dark, rain, and snow set it. The Cascade Range especially is prone to snow on Santiam Pass, but even the Coast Range gets snow now and then. I stayed a half hour to enjoy the absolutely awesome company here, but finally left before they had received their food orders. All I had was water (note my empty glass). Mark asked for some powerful double shot drink, probably to wind down from all my questions during the assembly earlier. 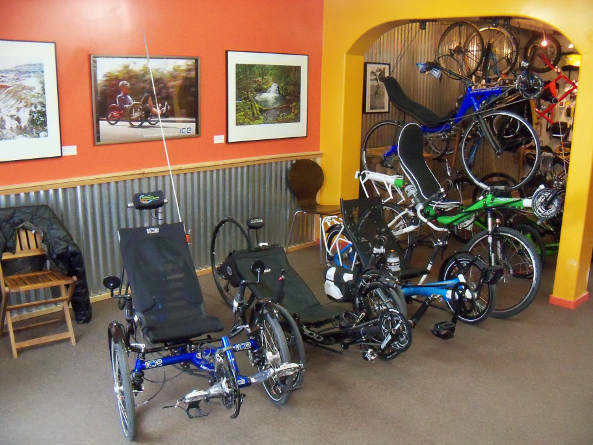 Trikers are a happy bunch, and always seem to be drawn to one another! Here, Renge’ realizes that she thinks this triker to her left is actually way cooler than the one to her right, so she claims her new prize, as Mark captures the moment on his phone cam. Wonder if she’ll like my new Wild Child haircut. 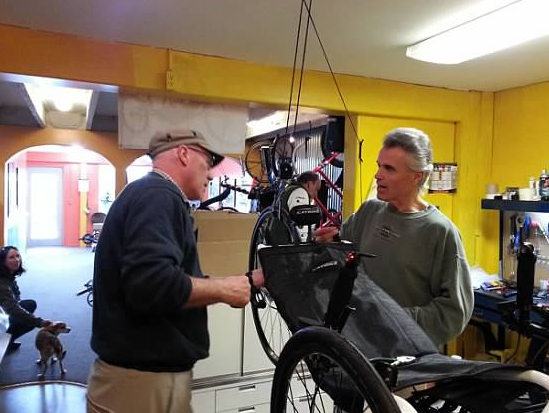 All right, the trike is built, trike hobo is happy to have it, and Mark is happy to be rid of trike hobo. I said my farewells to everyone and then booked back to the coast, through rain and all manner of weather that would surely stop any mere mortal. The trike gods were so happy about my new three wheels that they made sure I had safe passage all the way to the Pacific Ocean. So, now I am home typing to you once again. The trike is in the garage, but I can rationalize not riding it yet because it has been wet and rainy today again. Not only that, but I realize I have another problem that might keep me off it for a while. In all that excitement with my four triking buddies in Bend, all our joking around, all the merriment only trikers can ever know, I forgot to ask one very important question to Mark before I left! He wanted me to take it for a test spin before I loaded it into my borrowed car, but the hour was late, and with a group lunch looming at the restaurant, I felt I simply had no time to be riding the new wheels. 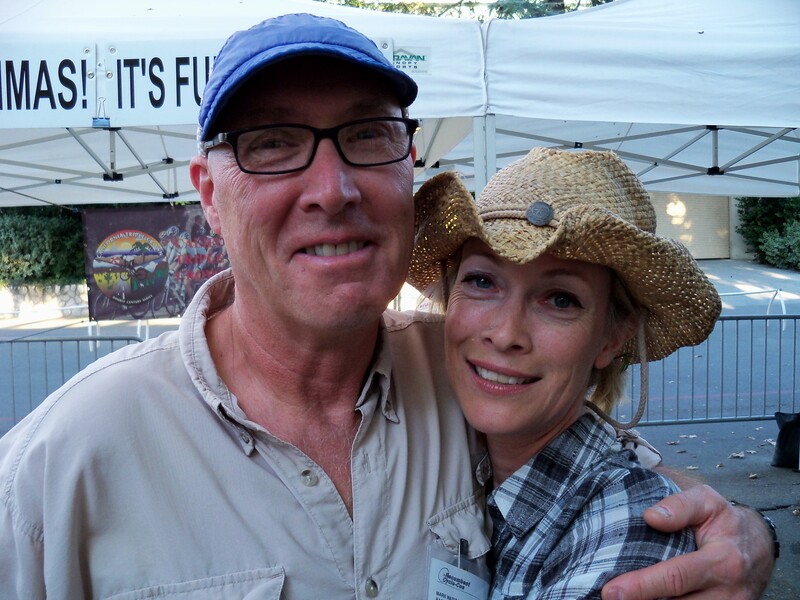 So, what was that really critical question that slipped my mind in Bend? Being one who has been riding a twist grip ICE trike for five years, it dawned on me that I have no idea how to use bar-end shifters! Bummer. Oh well, guess I can go down to the garage and sit in it at least. 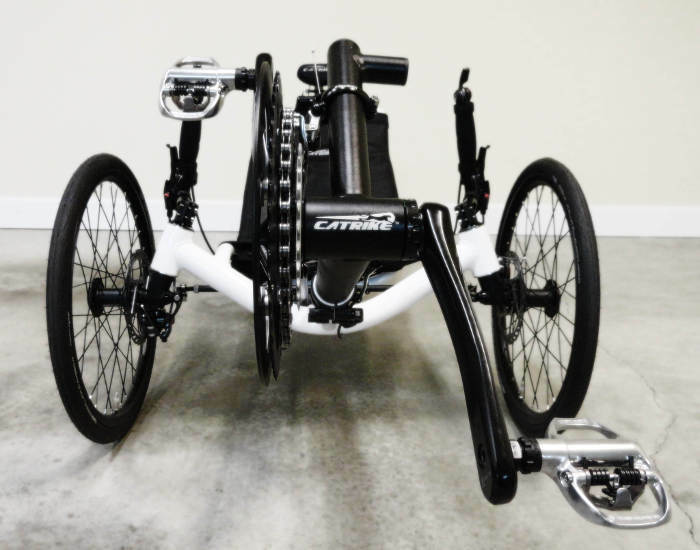 By the way, in case you have yet not guessed, or may be unfamiliar with trike brands and models in general, the trike I purchased through Mark is a 2014 white Catrike 700, acquired on the same day that Jeremy purchased a 2013 black Catrike 700 from Mark. What are the chances of that, on top of the coincidence of us meeting again after five years? Awesome day, awesome people, awesome trikes! Here are a couple dozen photos of Wild Child, taken yesterday, March 09, 2014, a trike that, as of this writing, has yet to be ridden by any human being! The anticipation is killing me! 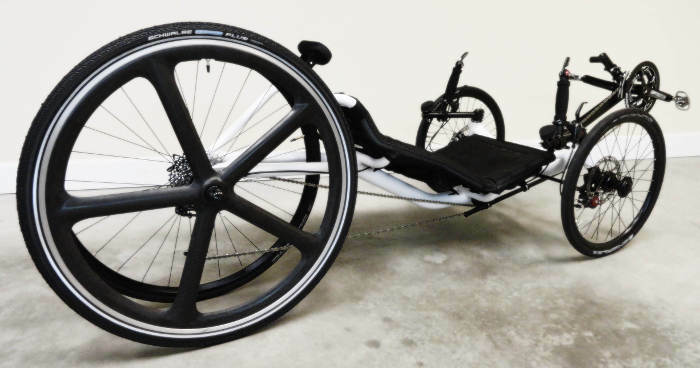 This wheel is the Aerospoke, a carbon hybrid that the company claims is okay to ride on the rear of a tadpole trike. 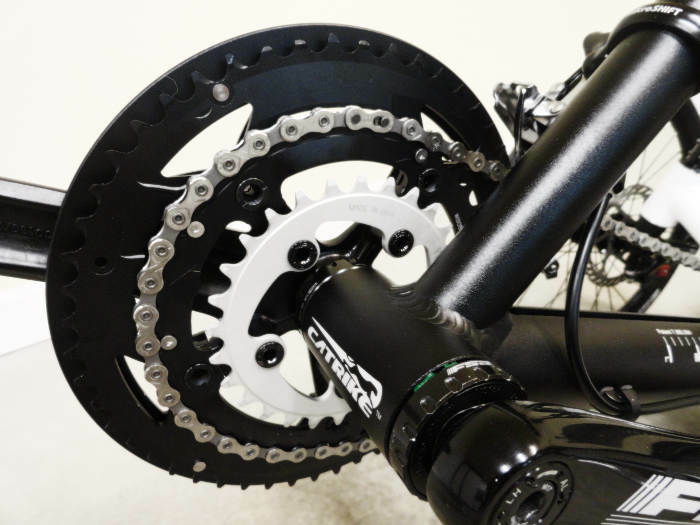 It is known for it incredible strength, aerodynamic qualities over traditional spokes, and its uncanny ability to offer up a flywheel affect, allowing riders to more easily sustain high speed runs. 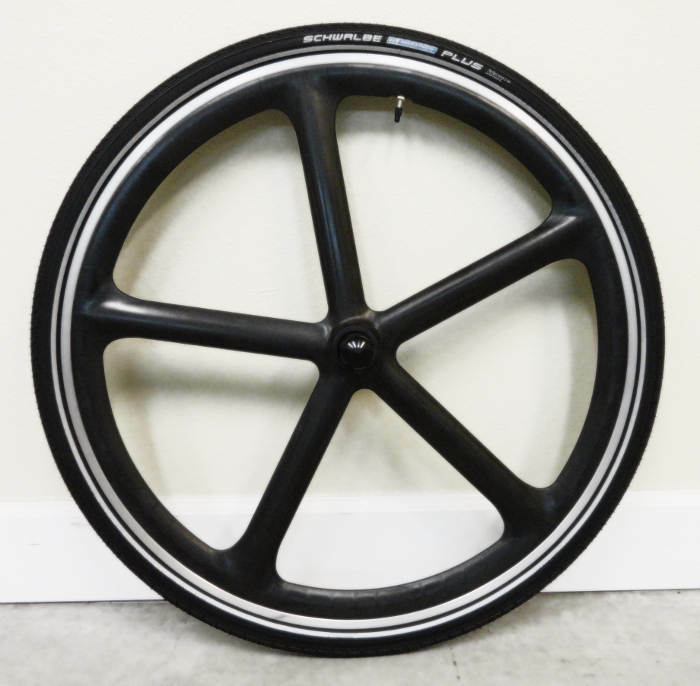 I was intending to put this on Wild Child at the shop Saturday, but Mark convinced me that it would be best to run the stock wheels because then I would have a direct comparison on how an Aerospoke wheel will improve the top end of a Catrike 700. 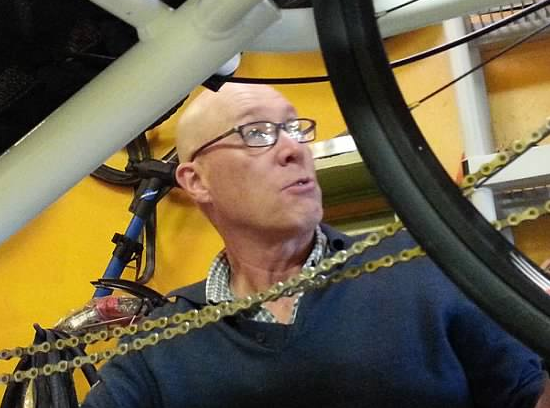 Mark said the readers would be curious, so I’ll put some fast road miles on the stock Velocity A23 rim and Schwalbe Durano tires before I mount the Aerospoke and Schwalbe Marathon Plus tires. 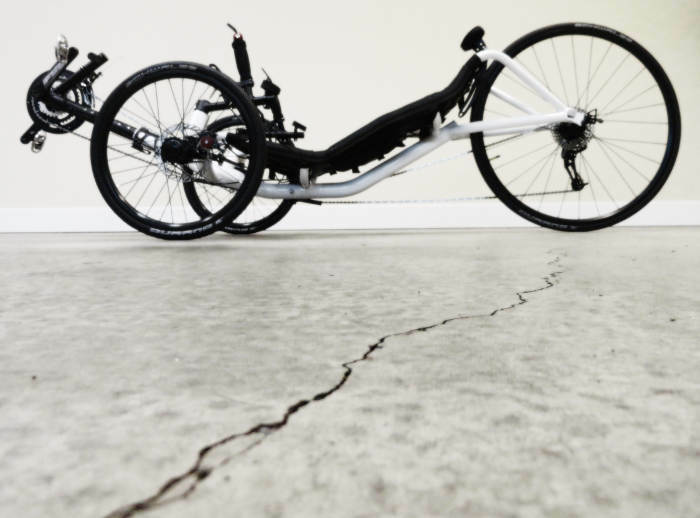 People on the forums are always complaining how Marathon Plus tires slow you down on a trike – all I can say is that we shall see, once and for all. 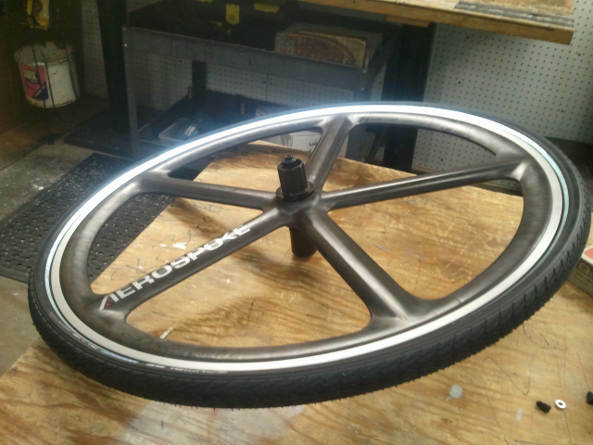 BTW, Aerospoke wheels are built inside Velocity racing rims. The reviews are very encouraging. At the bottom of this page is additional information about this aerodynamic speed wheel. The boom is set at the 29 mark. My X-seam is about 43. 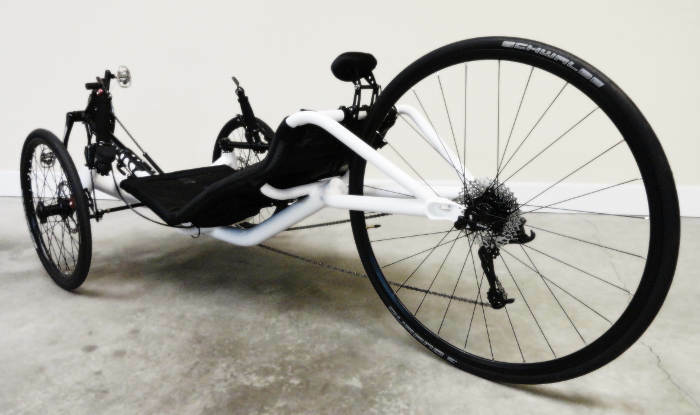 Catrike 700 fits X-seams from 39 to 46. 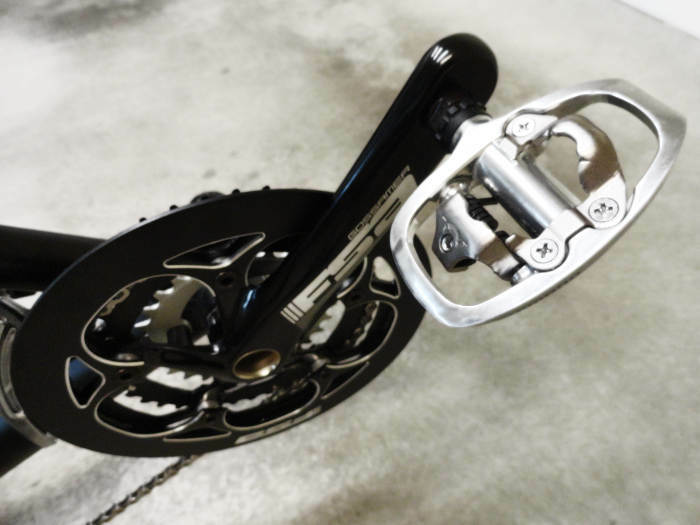 Shimano PD-A520 pedals are an upgrade I chose, a very popular and proven cycling choice. 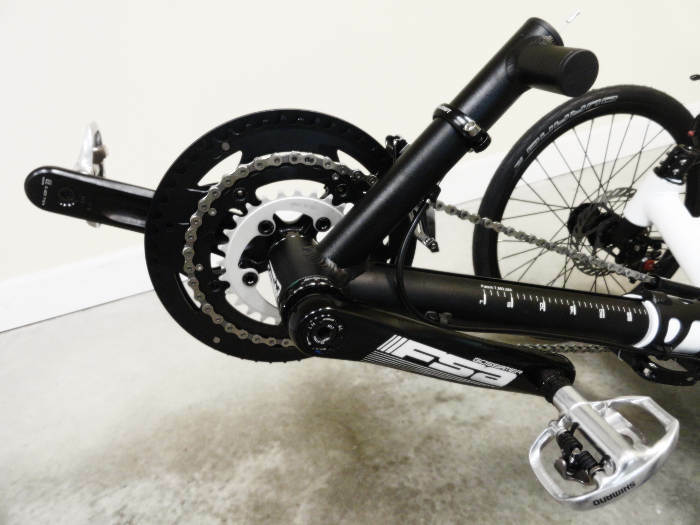 The stock Catrike 700 comes with a 30-39-52 FSA crankset, although the small 30 tooth ring is too large for serious touring (won’t get you up and over the mountains very well without blowing out your knees). So, I removed the 30 and substituted this 28, shown above. Two teeth make a huge difference! Even it may be too large, as I have found a 26 to be suitable on former journeys, but I decided to give it a try just to see if I could get up the mountains a wee bit quicker while also not damaging my knees. If the 28 turns out to be too large, I’ll go to a 26, but I am hopeful. Wild Child is so powerful, that the concrete cracked beneath its surging energy. 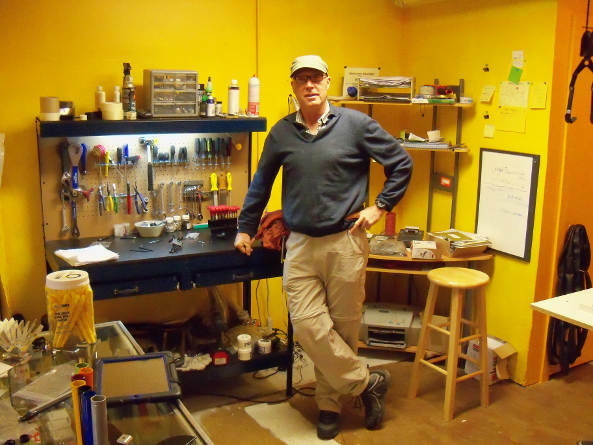 I was raised on high performance and speed, being the son of a fellow who was the editor and publisher of Hot Rod Magazine for a number of years, and who also served stints as editor of a couple of motorcycle magazines (Cycle, and later Motorcyclist). A professional career journalist, he always had the latest and greatest muscle car or race motorcycle at home that he was testing for an article, so I got to drive and ride most of them. I was hooked, and that passion never seemed to go away. Enter the recumbent tricycle into my life in 2008, and my first purchase of one in 2009, and I found the need for speed making a comeback. My ICE Q trike was low and fast, and it was all I knew from personal “on the road” experience for five years, but as my knowledge of trikes grew, it became evident that there were some real speed machines out there. Upon the sale of the Q in late 2013, I knew precisely what type of trike I wanted, and that was the fastest production model available. I had been saving up specially for this purchase, and had enough in my “trike account” to cover any one I wanted. Money was not an aspect of my consideration because I wished to acquire a “keeper”, one that would keep me satisfied for all my days, whether it be flying along on fast day rides, or adventuring on another overland trike odyssey. The new trike also had to be exceptionally light weight, having learned some hard lessons during my long-haul trike trips. Overloaded and overweight trikes don’t make for the most fun week after week of pedaling up mountains, or even long hills for that matter. If a trip becomes an ordeal of struggling up grades, the fun factor goes right out the window, and since my motto is: “Stay light, Ride far, Have fun” I sought a featherweight machine, while also redesigning my cargo paradigm to further lighten my load. For a trike to end up in my garage, it also had to be strong, reliable, and have a reputation that was second to none. 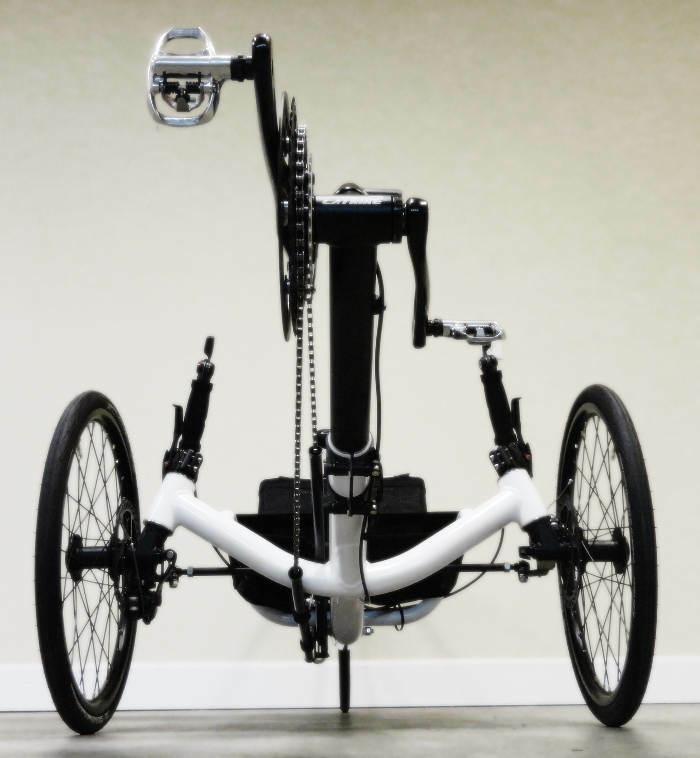 My financial resources aren’t sufficient for me to be experimenting with something new and as yet unproven for hundreds of thousands of miles by scores of other trikers. It had to be a vehicle I could count on for getting me back home on regional rides, and for getting me to the next town on overland journeys. The evolution of the tricycle is constantly changing, but I sought one that is currently on top in the owner ratings department. The top three contenders for my new triple were all neck and neck in the speed and weight department, in that they were all lightweight, and all wicked fast out on the road. They all were high quality machines, and the purchase of any one of them would not be a mistake. The difference in top end speed amongst them is marginal, although based on spec numbers only, the Swedish and American choices would slightly edge out the British choice – slightly, not enough to sway me one way or another. The heaviest two, coming in at 33 pounds each, were the British and American choices, with the Swedish choice edging them out by a few pounds. I was looking at three choices initially. Two would have to be imported onto the continent where I live, and the third is made in a factory to which I can actually pedal over land. 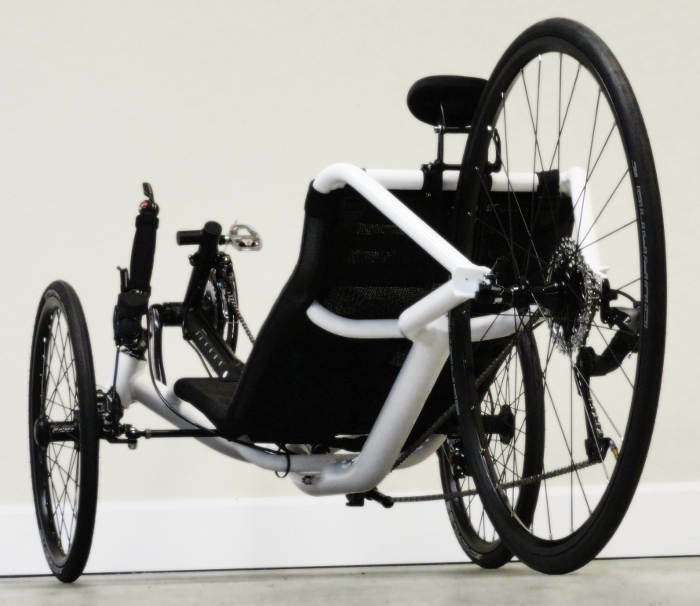 Having a desire for the fastest trike out there initially blinded me to certain ideological principles that I hold, namely the desire to preserve the environmental integrity of this planet I call home, and to choose willingly the individuals or organizations to which I supply my personal information. Two of the three trikes would lead me to violate these two principles, in that they would have to be shipped unreasonably long distances to me (huge carbon footprint), and that their purchases would have the governing organization of the country where I live requiring my private information against my wishes (Importer ID Input Record by the USA Department of Homeland Security). But there was more to it than that. Unlike most owners of speed trikes, I intend on using mine also for my overland journeys. Sure, I want a lightning fast triple for day rides and adrenaline surges, but I also want one that will do well on cross country trips, where heavy rainstorms are always a factor. Two of the trikes have hardshell seats that conform to one’s hind quarters very well, yet in so doing, they form bowls, in other words, containers for water that falls from the sky. Having ridden my former ICE Q in several drenching rain episodes during the past five years, I know how rain can even accumulate slightly on a mesh seat, but what about a hardshell bowl shaped seat? 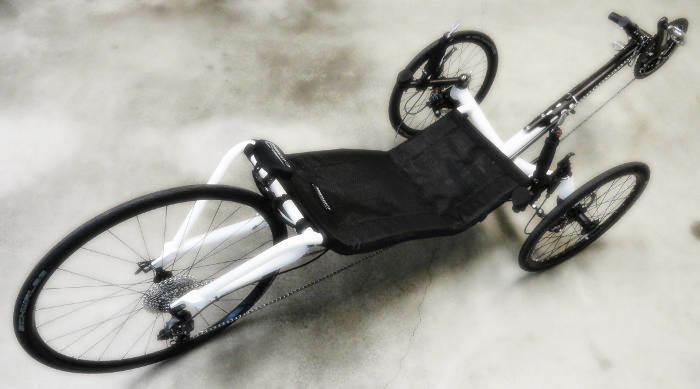 One of the ultra light speed trikes I was considering had a mesh seat that would very efficiently drain water at a rapid rate. When I first began my journey into the world of human powered recumbent tadpole tricycles back in 2008, one brand stood out above the others in my mind with regard to frame design, a design that not only looked well thought and efficient, but one that had to be the strongest out there due to its manner in which the tubes all seamlessly came together, which included the platform for the seat. 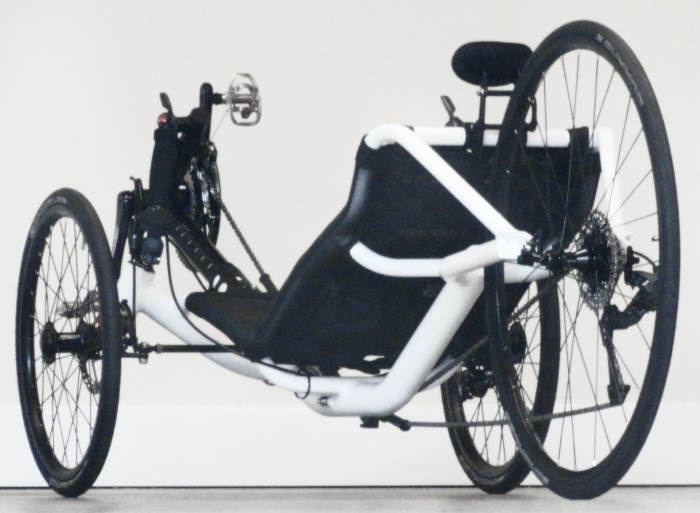 That brand was Catrike, which integrated the seat into the frame, unlike all the others where the seat always appeared to be an after-thought, just tacked onto the frame, which, in my way of seeing trikes, was not aesthetically pleasing like the Catrike models. Catrike seats did not sit “on” the frame – they were the frame! 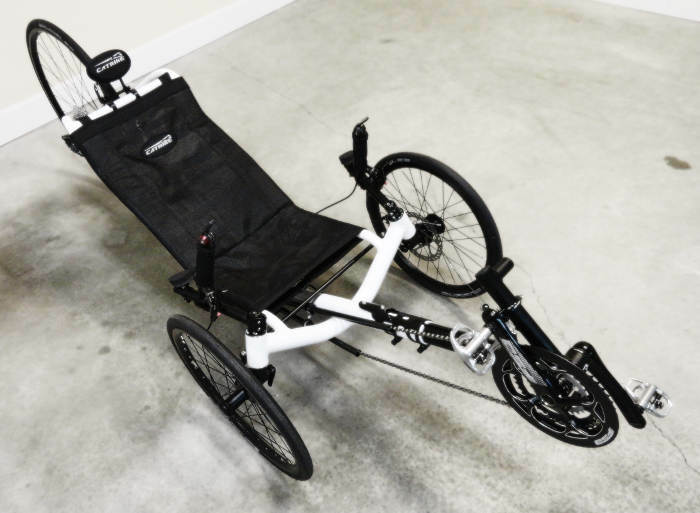 While there have been major design changes in Catrike models since 2008, three of the remaining models still incorporate the seat as part of the frame in a manner that, to me at least, looks fantastic (Pocket, Expedition, 700). 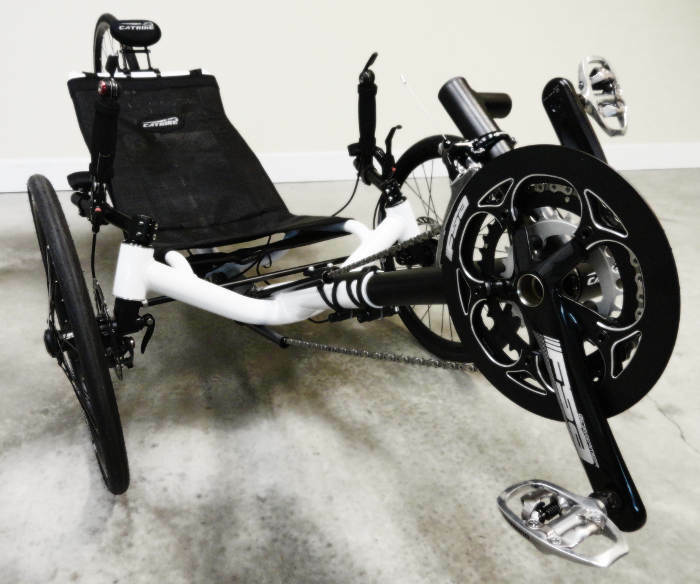 I believe the Catrike 700 frame takes a back seat to no other trike currently available. 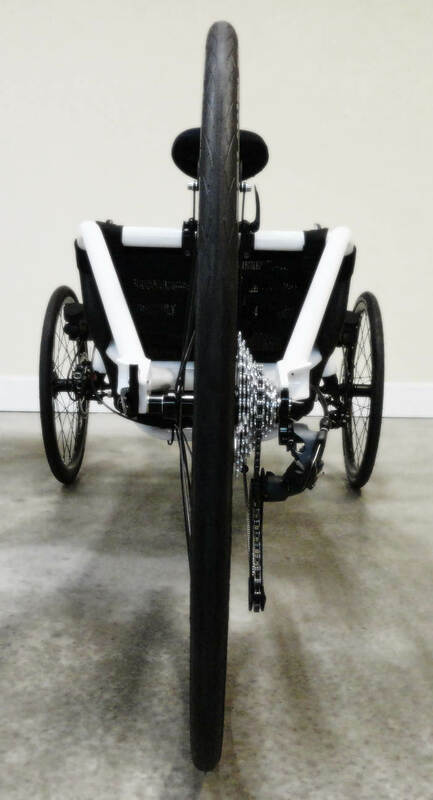 In fact, despite what I have often read on forum message boards about Catrike being somewhat less quality than ICE, I simply cannot see it, not because I now own one, but because after thorough inspection of this new trike in my garage, I see no aspect of it whatsoever that trails behind any of its competition. 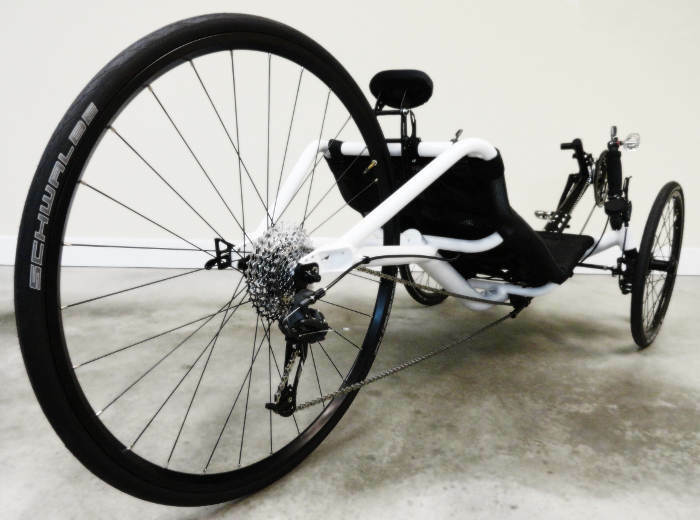 I acquired this trike because I found it to be of superior quality, second to none, and a proven human powered vehicle that will bring me many years of incredible enjoyment as I pedal my planet. Click image above for a larger view. Feel free to share these photos with others if you wish. I nearly neglected to include some photos that Hostel Shoppe emailed me several weeks ago when I ordered the Aerospoke wheel from them. Sorry about that Jessie and Scott! 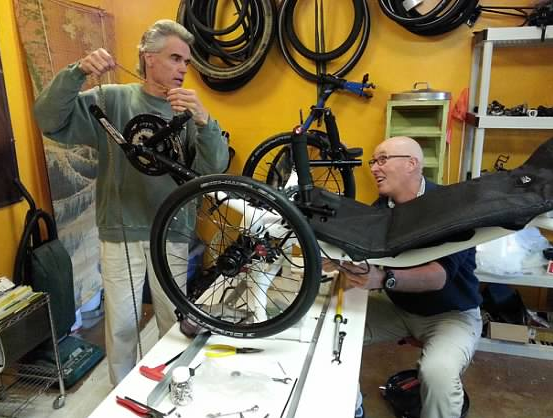 Anyway, here Scott, the chief wrench at Hostel Shoppe, mounts an EarthGuard tire liner, tube, and Scwhalbe Marathon Plus tire onto the new Aerospoke wheel that will find its way onto Wild Child. The ruggedness and stiffness of the wheel is unparalleled. You will feel the extra speed and confidence! 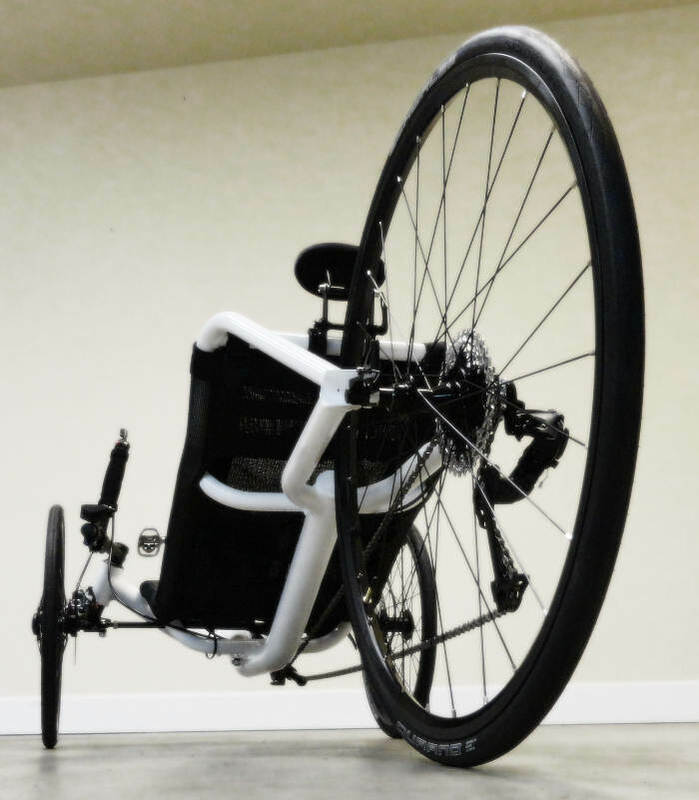 Aerospoke wheels were designed with every rider in mind, not just the 130 pounders. The wheels offer something for everyone; the sport rider, fitness rider, fixed gear, or commuter no longer has to true their wheels. They can use that time riding instead. The competitor (even the Clydesdale or Athena) can have a fast, aerodynamic wheel that is also durable and resilient. 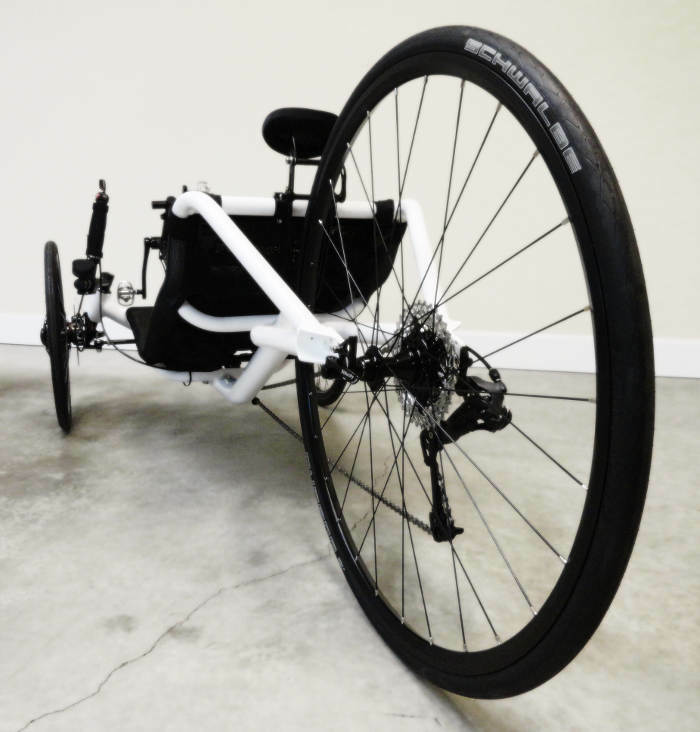 Aerospoke wheels start out true and remain true and are considered some of the stiffest wheels on the planet – maximizing power transfer efficiency without wheel deformation or lateral bending. Many competitive cyclists have a training and a racing set of wheels. They only use the racing wheels for special events, treating them like Grandma does her fine china. 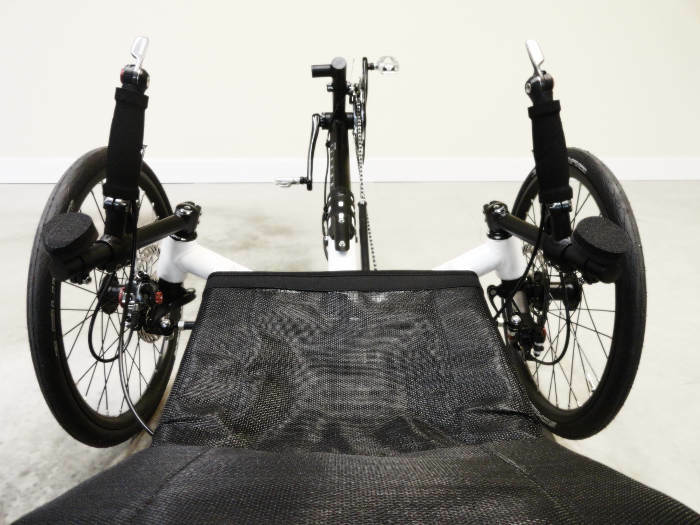 With Aerospoke you only need the one set; get on and ride them every day! 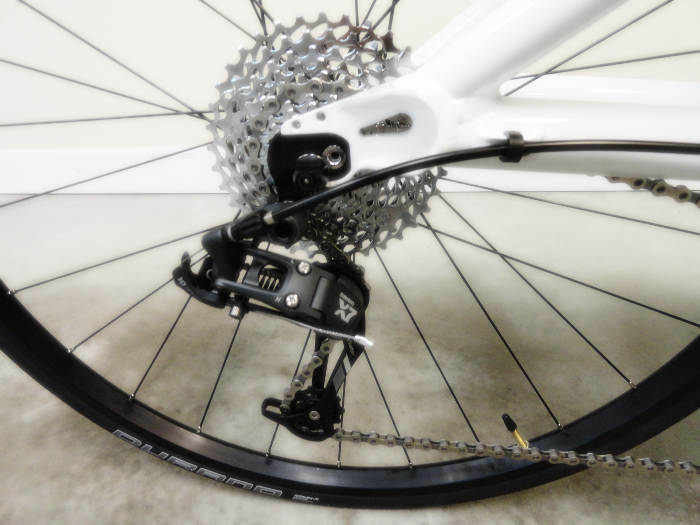 Add to that the quick-change hubs, sealed bearings, and their easy low-cost exchange policy and you have the best winning combination in all of cycling. Aerospoke wheels are priced far below many other high-performance wheelsets, so you don’t have to sacrifice your groceries to get them. 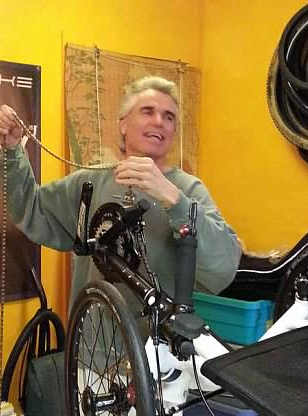 No expensive trips to the bike shop for truing adds to the value. Our aerodynamic spokes have a wing-like cross-section, reducing drag substantially. Comparing how our wheels cut through the air to how traditional spoke wheels do is like comparing a sleek aircraft wing to an old-fashioned egg beater. Wind resistance becomes more and more important as a wheel spins faster until it trumps weight as a key performance enhancer. The strength of our wheels is legendary. Some call them “bombproof”. Our wheels can withstand punishment unimaginable for other wheels. 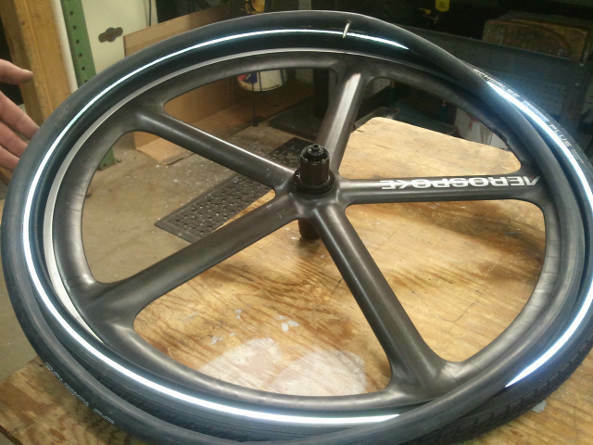 When police bike fleets are looking for rugged wheels that must deliver without question, they choose Aerospoke. Clydesdales and Athenas can leave their spoke wrenches at home for good. Our wheels have far less maintenance points than traditional wheels; hit a bump or a pot hole and keep on riding. 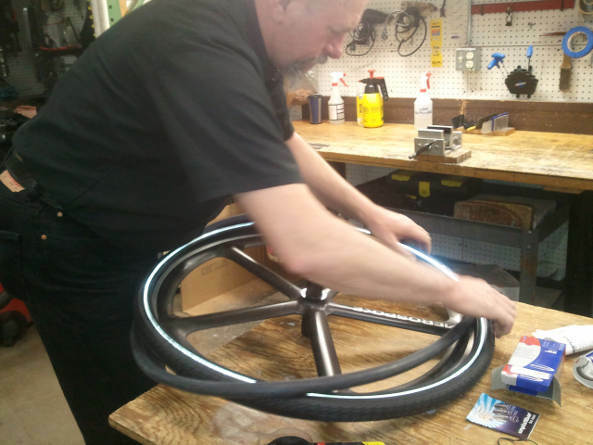 Many of our customers tell us they choose our wheels for long distance trips – those 500, 1,000, even 5,000 mile odysseys where wheel maintenance cannot be an issue. Our wheels deliver. Our five-spoke wheels are classic. Whether viewed in their natural, charcoal color (carbon color), painted or our new advanced graphics patterns, these wheels really set off the entire bike. We can provide wheels in a wide array of patterns, including camouflage, diamond plate, carbon weave, skulls, American Flags…you name it. Check the store for options and availability. Our hubs and hardware are machined from solid billets of 7075 Aluminum – the same superior quality aluminum alloy found in aircraft. Ratchets and cassettes are made from ion-nitride steel for maximum hardness and durability. All hubs and hardware are made in our New Hudson, Michigan plant to exacting quality standards. 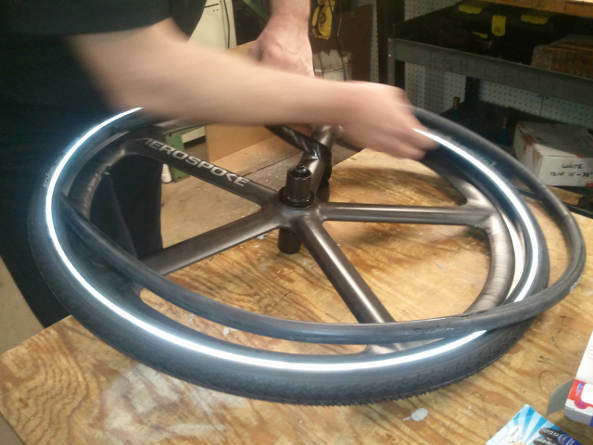 Aerospoke considers Velocity Rims some of the finest made and is proud to use them exclusively on our wheels. The 700c wheels use a 20mm Aerohead clincher rim. 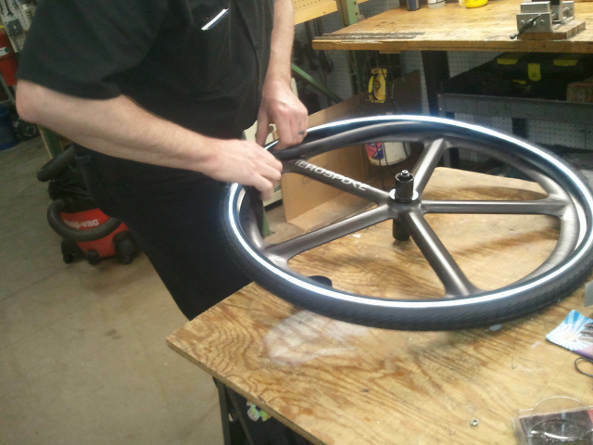 All Aerospoke five-spoke wheels are assembled proudly using American craftsmanship and the finest materials. We machine and assemble the components of our hubs and hardware in our New Hudson, Michigan facility. 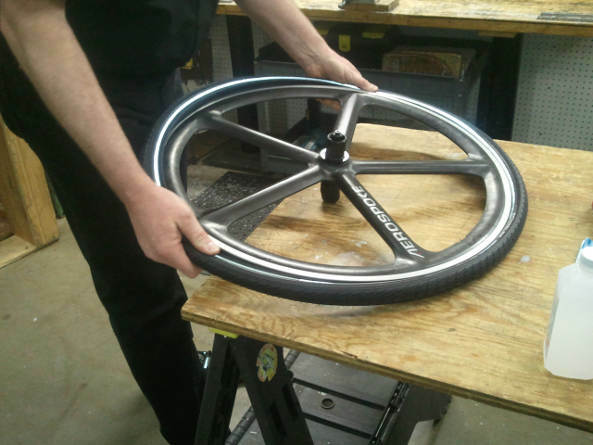 Each wheel receives a multiple-point inspection to ensure that our strict manufacturing tolerances are maintained.